Notes: Cheadle Heath Station was situated on the Midland Railway’s (MR) New Mills to Heaton Mersey line, which formed part of its main line between Manchester Central and Ambergate. The New Mills to Heaton Mersey line was built purely to make MR services between Manchester Central and London St Pancras faster. The MR had first reached Manchester in 1867. However they did not have their own station in the city. The MR had to use the Manchester Sheffield and Lincolnshire Railway’s (MSLR) line from New Mills to Hyde, and the MSLR line from Hyde to the London North Western Railway (LNWR) terminus at Manchester London Road. Although the MR and MSLR had an amicable relationship, the same could not be said with regard to the MR and the LNWR. Through partnership and take-over the MR was able to establish a route into Manchester Central Station from 1st January 1880.
ran through Stockport Tiviot Dale. To the west of Stockport trains turned north onto the MR’s own Manchester South District Line which passed through Heaton Mersey and Didsbury. Although Stockport provided many passengers the route was not direct, and, with lots of junctions, it was quite slow. The solution was to build a direct line between New Mills and Heaton Mersey for a cost of £2 million. The new line would allow fast express services to substantially improve journey times between London St Pancras, Manchester and Liverpool. The new line was authorised in 1898 and work began immediately. Despite the need for some very heavy engineering, including the construction of a two mile long tunnel at Disley, the line was ready for use by 1st July 1902.
route through Stockport Tiviot Dale the MR felt that it needed to provide a station that would allow Stockport residents to enjoy the fast services on offer. Just to the north of the station was a junction where a spur came in from the CLC Glazebrook to Woodley line. The spur allowed express trains from Liverpool Central to run onto the New Mills line. Cheadle Health was in a shallow cutting, and it was provided with five platform faces, four of which were through platforms. On the east side of the station was the entrance building at street level, a single storey brick structure that provided booking facilities. A small canopy was provided over the main entrance door. Steps led down to what was called the up Manchester platform which was adjacent to the building on the east side of the line: ‘up’ meant away from Manchester towards London. At the south end of the up Manchester platform there was a single track bay platform. A bridge led from the station building across the line and connected to the down Manchester and the up and down Liverpool platforms. The down Manchester and up Liverpool platforms were one island platform. As the names given to the through platforms suggest, the Manchester platforms were served by express services running between Manchester Central and points to the south and the Liverpool Platforms by trains running between Liverpool Central and points to the south. The Liverpool line platforms, however, were also used by local services that terminated at Cheadle Heath. Each platform had its own canopy and waiting facilities. Stockport Tiviot Dale, but some did use the route through Cheadle Heath. An intensive service of stopping trains, known as the ‘South District Services’, ran between Cheadle Heath and Manchester Central providing a commuter service to and from the city. Cheadle Heath was also provided with extensive goods facilities. They were located on the west side of the line and included a large goods warehouse. 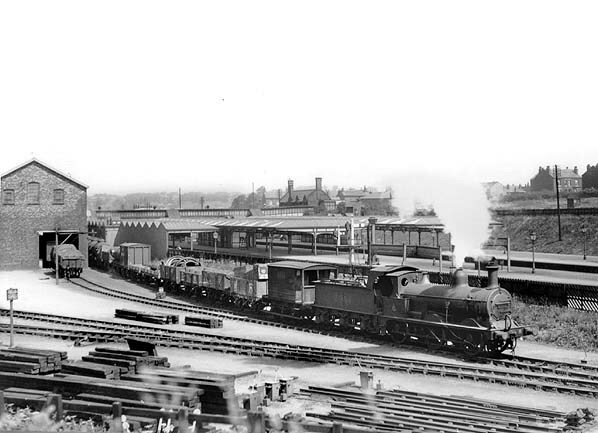 There was a steady stream of goods services through the station and in and out of the goods yard. In 1923 Cheadle Heath station became part of the London Midland & Scottish Railway (LMS). 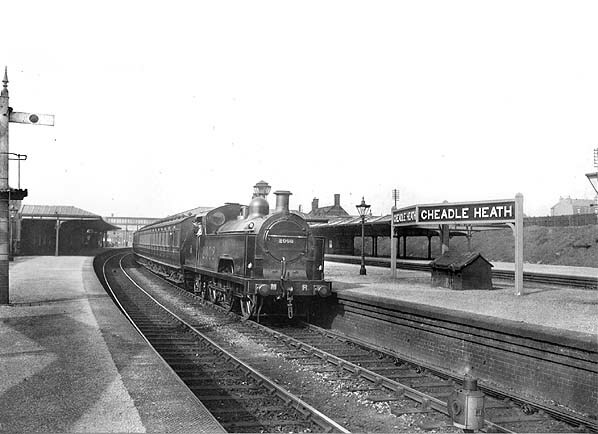 Throughout the 1920s and 1930s services through Cheadle Heath reached their peak. By 1939 there was a South District service frequency of every ten minutes on weekdays. Over forty trains ran out from Manchester Central although only half of them terminated at Cheadle Heath; the other half went to Stockport Tiviot Dale. Express services continued to run between Liverpool, Manchester and London St Pancras, Nottingham and Derby. Services also ran to Buxton and Sheffield. 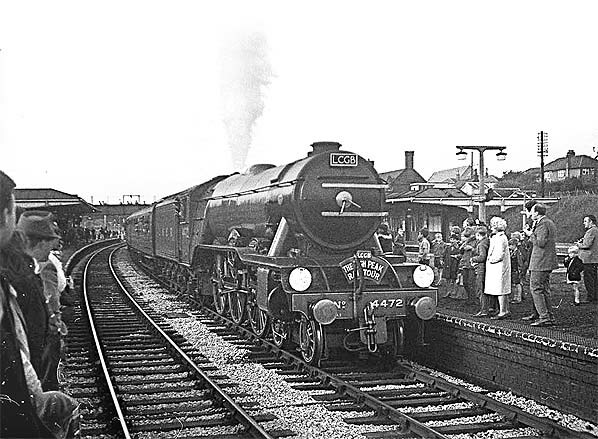 During the Second World War passenger services were reduced and, although after the war they did increase again, they never returned to levels seen in the 1930s. In 1948 Cheadle Heath Station became part of the nationalised British Railways (London Midland Region). Throughout the 1950s, despite increasing competition, Cheadle Heath station remained busy, especially for main line services. how important the station was. 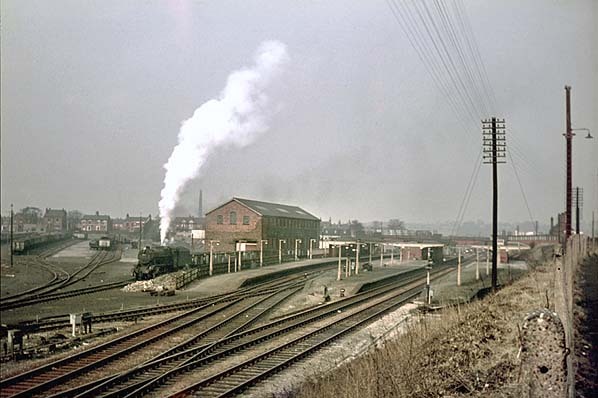 Between 1960 and 1966 the former MR route from Manchester to London became the more important as the other route, the former LNWR line via Stoke and Rugby, was being electrified as part of the West Coast Main Line electrification scheme. The work caused substantial delays to trains using the West Coast route, so the former MR route was much preferred. Also, in 1960, DMUs were introduced onto the local service from Cheadle Heath to Manchester Central. Although these trains were much more comfortable than their steam-hauled predecessors they were never called upon to offer the same intensity of service. In 1966 the West Coast electrification between Manchester Piccadilly and London Euston was complete, and train services along the route became the fastest in the Country. The former MR route could not compete, besides which the 1963 Beeching Report had identified it as a duplicate route and had recommended the withdrawal of passenger services. 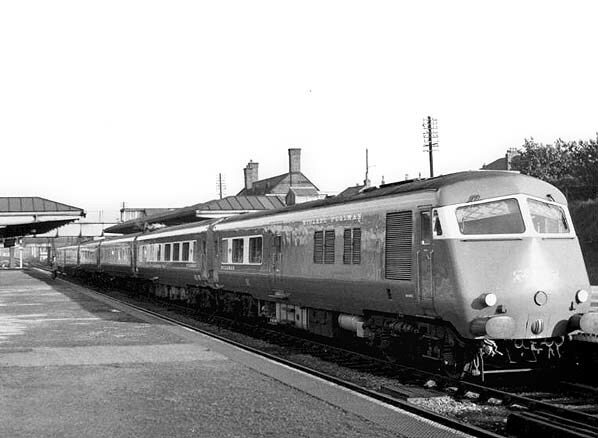 In April 1966 an electric-hauled Pullman service started to operate on the West Coast route, and Cheadle Heath’s most prestigious train, the Blue Pullman, was withdrawn. Other express and local services lingered on until 6th March 1967 when Cheadle Heath closed to passenger services. Just over a year later on 1st July 1968 the station’s goods facilities also closed. With the closure of Manchester Central in 1969 the line northwards from Cheadle Heath did not last long, and it closed in 1970. 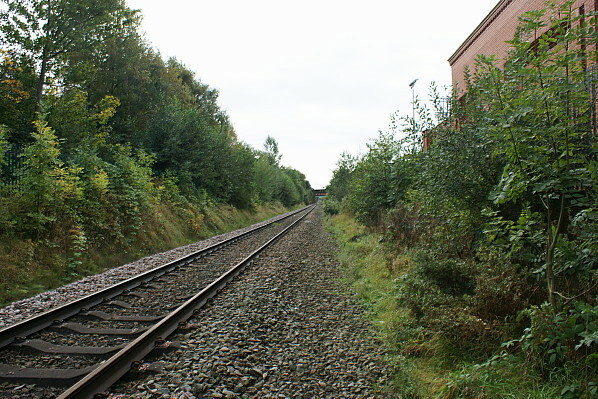 The spur that connected to the Glazebrook route remained open for goods services, primarily for stone trains that ran, and continue to run, from the Buxton area to Northwich. By 1972 all of the station’s buildings had been demolished, but its platforms were extant, and four of the five lines that passed through the station were still in place. The goods sidings had all been lifted, but the goods warehouse survived into the 1980s. 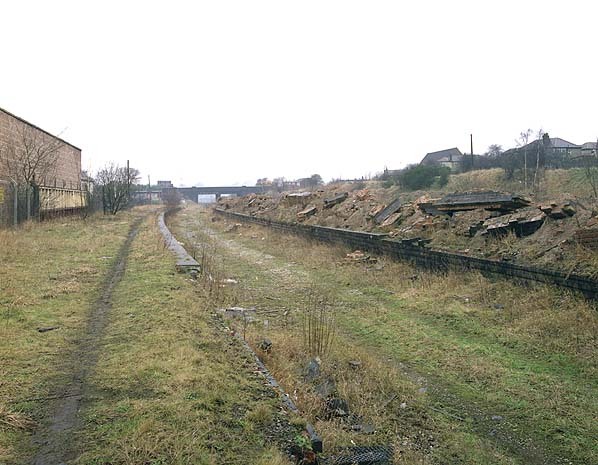 By the end of the 1970s only two lines remained, but the platforms still survived. At the end of the 1980s the former important MR route through Cheadle Heath had been reduced to a single track. Today nothing survives of the station. The goods yard and the site of the slow line platforms have been developed as a supermarket. The line remains open for goods services. Sources: . Lost Railways of Merseyside and Greater Manchester by Gordon Suggitt. Published 2004 by Countryside Books ISBN 13: 978-1853068690 British Railways Past and Present – Cheshire by Paul Shannon & John Hillmer, Scenes from the Past: 13A Stockport Tiviot Dale by Gregory K Fox. Looking north in 1907 as a local train arrives at Cheadle Heath Station along the line that comes in from the Liverpool direction. It is quite possible though that the service is a 'South District' train that has travelled from Manchester Central. South district services would cross to the Liverpool lines to terminate at the island platform. This would leave the main line between Manchester and the south clear. In Midland Railway days a goods train draws into the goods yard at Cheadle Heath station. The passenger station can be seen in the background. Manchester Piccadilly to London Euston. 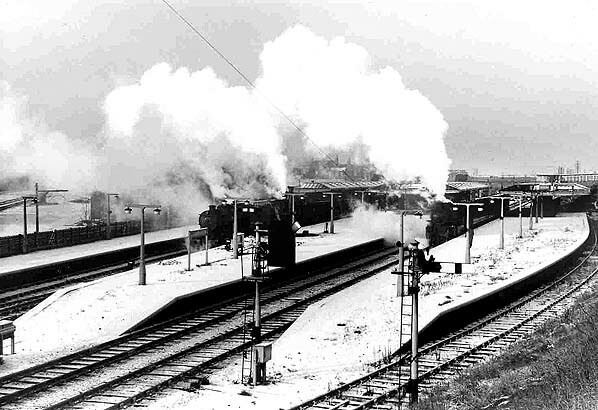 Looking northwards at Cheadle Heath station on a winters day in 1960. The picture clearly shows all of the five platforms. Starting from the right is the bay platform. Next to it is the southbound fast line platform which was also known as the 'up' Manchester line platform. Moving to the island platform the platform face nearest to the photographer is the northbound fast line platform which was known as the 'down' Manchester line platform. The next platform to the right was a southbound platform which was known as the 'up' Liverpool line platform. Finally there was a northbound platform which was known as the 'down' Liverpool line platform. Liverpool trains travelled along the lines to the left of the picture hence the 'Liverpool' title bestowed on the platforms. South district terminating services from Manchester Central also tended to use the 'Liverpool Line' platforms so as to keep the main line clear. 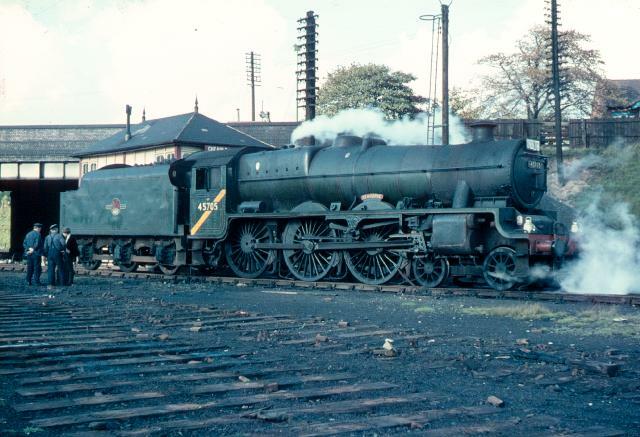 Looking north from Cheadle Heath's platform 4 on 18th September 1965 as ex LNER A3 number 4472 Flying Scotsman arrives with LCGB High Peak Railtour. 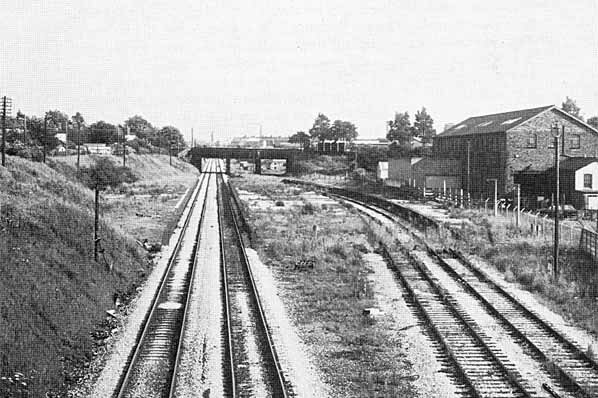 Looking north at Cheadle Heath station and goods yard in the 1960s. A train of mineral waggons passes the station on the avoiding line that ran behind the westernmost platform. The goods sidings are all full with waggons. 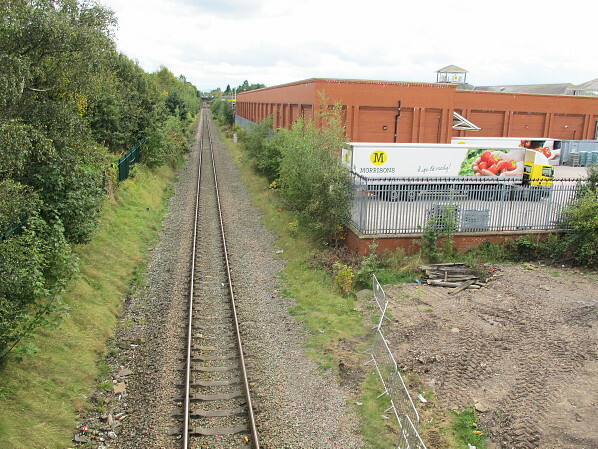 In the foreground is the junction between the Liverpool and the Manchester lines, the tracks nearest to the photographer being the Manchester lines. Looking south at Cheadle Heath station in 1972. Five years after closure the station buildings have all been demolished but the platforms are still extant. From the left of the photograph to the right the platforms were numbered 1, 2, 3, 4 and 5. In 1972 only platform 5 had lost its track although the lines through the former platforms 3 and 4 had clearly been out of use for some time. Looking north in April 1984 at the two island platforms. To the right is the island platform that was numbered 2 and 3 and to the left is the platform that was numbered 4 and 5. The two platform faces seen in this picture are 3 to the right and 4 to the left. At this date lines still ran through the former platforms 1 and 2. Beyond the bridge in the distance was a junction from where lines continued north to Manchester central and veered to the west providing access to Liverpool. The site of Cheadle Heath station looking south in October 2012. Nothing survived of what had been a main line station. Looking south at the site of Cheadle Heath station in October 2012.